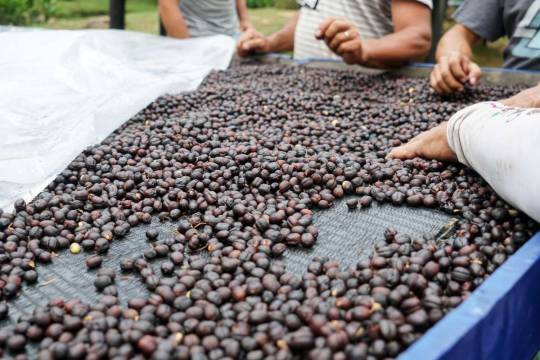 Costa Rica contributes less than 1% of the world’s coffee production, yet it has a strong reputation for producing relatively good quality coffee like this which is grown on a farm in Herbazu by Tono Barantez, located in the West Valley Region along the volcanic mountain range. This coffee has notes of red plum, black raspberry, and raw sugar with a syrupy body and only available in small quantities (only 25 sacks worldwide). West Valley has a high percentage of Cup of Excellence winners and grows an abundance of both the Costa Rica–specific varieties Villa Sarchi and Villa Lobos, as well as some of the more “experimental” varieties such as SL-28 and Gesha. Costa Rica was the first Central American country to have a fully established coffee industry dated back from the 1700s. In recent years, coffee producers are increasingly interested in using variety selection as another way to stand out in the competitive market: SL-28 and Gesha are becoming more common, and local varieties like Villa Sarchi and Venesia.